Humanity is at its best when it cooperates. The International Space Station unites people the world over in an exciting shared scientific endeavour. The global eradication of smallpox was a goal few thought achievable when the programme started in 1966 yet by 1980 the job was done. Now, in the aftermath of the Paris agreement, it is time for humanity to cooperate to reduce carbon emissions. Much needs to be done. 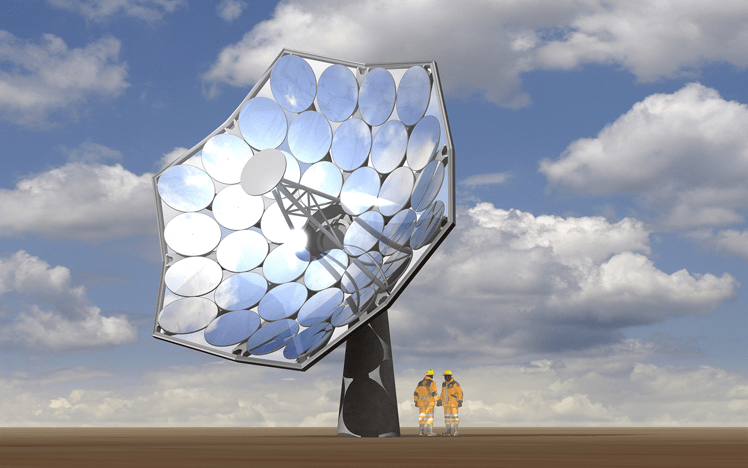 One possible project would be a global collaboration to develop and deploy concentrating solar power on a truly massive scale. Concentrating solar power is a technology that has been known about for a very long time. In the 1870’s Auguste Mouchot built systems that worked. However cheap fossil fuels after the First World War killed off this industry. By using those cheap fossil fuels we have unwittingly destabilized our climate. Now is the time to introduce carbon taxes and to use them to fund the development of cleaner alternatives, and none has greater potential than the many forms of concentrating solar power. In concentrating solar thermal power mirrors or lenses are used to focus the sun’s energy onto a receiver that takes this heat to make steam and so drive a turbine to make electricity, or to desalinate water, provide direct power to industrial process or domestic heating and cooling. Alternatively the sun’s energy can be focused onto a high specification photovoltaic receiver to directly make electricity. There are a rapidly growing range of hybrid systems, one of my current favourites being the dsolar system being developed by IBM and Airlight Energy. The Masdar Institute in Abu Dhabi, and several other research programmes around the world are also doing great research. All this needs to be scaled up and deployed in those sunny climates where this technology would work best. Let’s look at one example. The 50 MW Godawari and 125 MW Dhursar solar power stations in Rajasthan opened in 2013 and 2014. India has moderately ambitious plans to expand its solar programme. With the right market signals (like a carbon tax), international scientific support and financial investment this could be massively scaled up and Rajasthan could become a global centre for research, development and deployment of concentrating solar power. India could then quit coal, develop clean urban mass transit systems and cities like Delhi could have air fit to breathe. The health benefits for the people of Delhi would be obvious, and benefits for climate stabilization would be global and profound. This entry was posted in Climate Change, Energy, Global, Politics on 29 January 2016 by Richard. 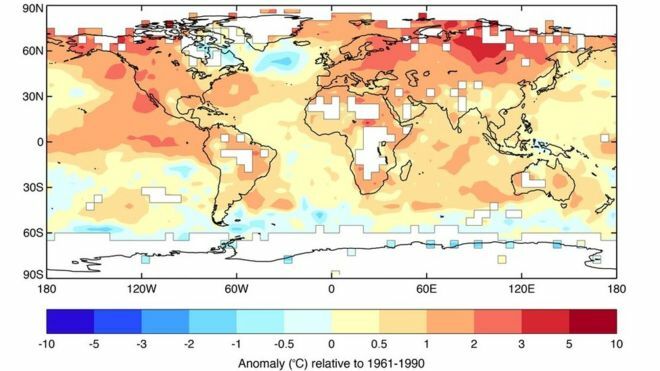 2015, the warmest year on record, temperatures were well above average in most places. 2016 looks like becoming a pivotal year. 2015 was the warmest year on record. Extreme weather events are becoming more common. December’s climate conference in Paris set a goal to try to limit warming to 1.5 degrees. The window of opportunity is narrow: speed of action is now critical. Standard & Poor’s, the influential credit ratings agency, suggest following Paris a surge of $16.5 trillion will flow into the renewable energy, clean tech and green finance sector. In April I blogged the news that China was planning the closure of 2,000 coal mines: this week China has increased this to 4,300 mines and also imposed a three year moratorium on opening new coal mines. China’s coal use grew dramatically over the decade to 2012, levelled off by 2014 and fell in 2015. Coal use is now beginning to fall in many countries. This is one area where the UK is showing leadership, planning the phasing-out of all coal fired power stations by 2025. Humanity needs to acknowledge that the age of coal is over. Dramatic changes are afoot in the world of oil. I last blogged about the falling price of oil back in August when the price had fallen to $42 per barrel. This week it dropped to $28. Some analysts are predicting the price of oil to keep falling, with prices as low as $20 or even $10 per barrel offered up as possibilities. Other analysts are forecasting the price to rise, perhaps sometime later this year. In truth nobody knows. Currently supply exceeds demand, so forcing prices downwards. Most countries are now producing oil at a loss. The break-even point for many fields is over $100: this is why we are seeing companies pulling out of the Arctic, deep water drilling and Alberta Tar Sands. However many countries are producing vast quantities of oil, losing money on every barrel, just to secure market share. They do this in the belief that in future this market share will be profitable. What few are contemplating is that this may never be the case. Some predictions are that Saudi Arabia will be bankrupt within 5 years as it keeps pumping vast quantities of oil at a massive loss, and keeps spending in the belief that it will be able to pay its debts with future oil profits. Oil, like coal, is a fuel of an era that is over. The future lies with energy efficiency, clean tech and renewables. A growing number of countries are pioneering profitable economies in this new emerging world. I said recently to a friend that I thought Ethiopia might become a richer country than Saudi Arabia, possibly within a decade or so, and probably within a couple of decades. My friend laughed at me. It is hard to conceive of such a reversal of fortunes happening so quickly. Yet change needs to happen, and is happening remarkably quickly. We are witnessing the death throes of ‘The Fossil-Fuel Age’ and the birth of ‘The Solar Age’. This entry was posted in Climate Change, Energy on 23 January 2016 by Richard. Most years on this blog I like to acknowledge outstanding people and technologies. Lots of newspapers do something similar around the Christmas and New Year, so I’m a bit late this year. Never mind: here goes. Last year I listed 5 of the best solar technologies that I’d written about over the preceding year. This year I want to acknowledge the importance of storing surplus wind and solar power to be used when the energy is required, and for it to be used in new super-efficient and pollution minimizing ways. Three impressively innovative UK companies each utilizing this ‘wrong-time’ electricity and using it as storable gases, or as storable heat, are Dearman, ITM Power and Star Renewables. The three of them are my joint ‘Technology of the Year’ winners, and between them have much to contribute to humanity’s changing use of energy. In November I blogged about Croydon based Cleantech start-up Dearman and their innovative liquid nitrogen engines for cooling and for power. Good to see Park Vale Capital have just invested £16m to help them expand. In September I blogged about the hydrogen economy and Sheffield based ITM Power’s innovative ways of converting surplus renewables to storable hydrogen either for use in fuel cell vehicles or added to the gas mains for flexible storage and use. As they expand there are lots of good news stories on their website. 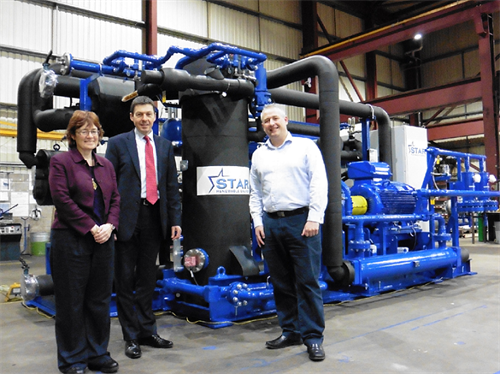 In August I blogged about big heat pumps and the innovative Glasgow based manufacturer Star Renewables, who supplied the ground-breaking systems at Drammen in Norway and the new Cranbrook development near Exeter. In the political and diplomatic field I’ve chosen three people who helped make the Paris agreement the historic breakthrough that it was: Christiana Figueres who guided the whole process, Francois Hollande who hosted it and Tony Le Brum of the Marshall Islands who led the High Ambition group that got the aim of a 1.5 degree limit to warming into the final document. This entry was posted in Climate Change, Energy, Politics on 15 January 2016 by Richard. I’m just back from a short holiday in Cumbria: great fun sharing a hostel with a group of eighteen friends. We did quite a bit of walking despite the rain and flooding. In Keswick the locals seemed to be making heroic efforts to clear up after the floods. Weather records are being broken faster than ever, locally and globally. 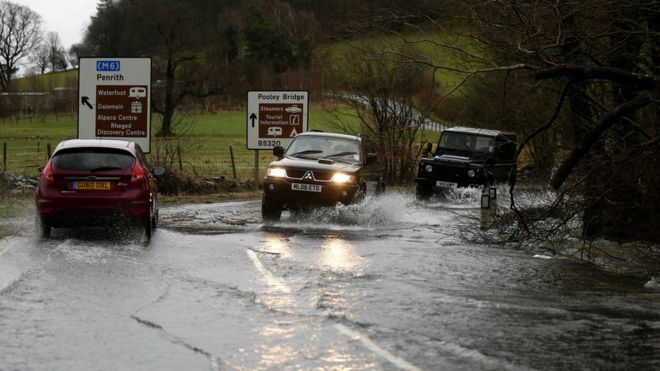 Storms Desmond, Eva and Frank have swept through Britain over the last month. 13.44 inches of rain fell at Honister Pass in Cumbria in a 24 hour period from 6.30 pm on 4th December to 6.30 pm on 5th December, a new national record. I doubt it’ll be a record that lasts that long. The sea and the air are warming due to climate change, and warmer air carries more moisture. Of course blaming any individual weather event on climate change is difficult, but patterns of individual events show trends that fit with climate predictions. These last few weeks have seen lots of extreme weather events in many countries. As atmospheric carbon levels increase the greenhouse effect means temperatures are rising both in the oceans and on land. Weather systems are becoming more energised, more dynamic and less predictable. The only way to halt the process is to stop emitting carbon into the atmosphere and start sequestering it back out of the atmosphere and safely locking it into soils, forests and using it for a range of new products like carbon negative cements. In the wake of the Paris conference we need strong political action to reduce emissions. On this blog throughout 2016 I’ll continue to highlight some of the best ideas, technologies, projects and developments that show that a low carbon economy is possible and could bring multiple benefits apart from just saving us from the worst ravages of a changing climate. This entry was posted in Climate Change on 5 January 2016 by Richard.